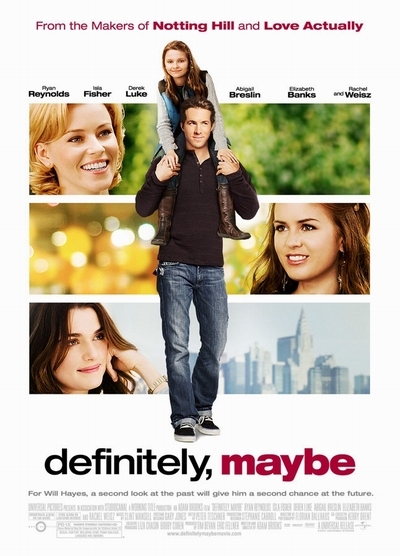 Story: Ryan Reynolds stars as Will Hayes, a 30-something Manhattan dad in the midst of a divorce when his 10-year-old daughter, Maya (Abigail Breslin), starts to question him about his life before marriage. Maya wants to know absolutely everything about how her parents met and fell in love. Will's story begins in 1992, as a young, starry-eyed aspiring politician who moves to New York from Wisconsin in order to work on the presidential campaign. For Maya, Will relives his past as an idealistic young man learning the ins and outs of big city politics, and recounts the history of his romantic relationships with three very different women. Will hopelessly attempts a gentler version of his story for his daughter and changes the names so Maya has to guess who is the woman her father finally married. Is her mother Will's college sweetheart, the dependable girl next door Emily (Elizabeth Banks)? Is she his longtime best friend and confidante, the apolitical April (Isla Fisher)? Or is she the free-spirited but ambitious journalist Summer (Rachel Weisz)? As Maya puts together the pieces of her dad's romantic puzzle, she begins to understand that love is not so simple or easy. And as Will tells her his tale, Maya helps him to understand that it's definitely never too late to go back...and maybe even possible to find a happy ending.